We begin today’s Weekly Roundup in the FT, with the Chart That Tells A Story. This week it was about interest only mortgages. 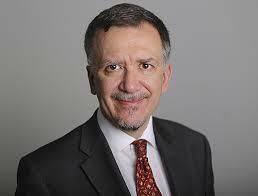 James Pickford reported that older borrowers are the most likely to have interest-only mortgages. That’s not a great shock to me, as they were aggressively marketed when interest rates were much higher (and repayment mortgages were there much more expensive). The last mortgage I ever had was interest only, but I took that out in 1995. Recently they seem anecdotally to be most popular with buy-to-let investors. According to James, they make up only 2.8% of mortgage lending today. But as recently as 2007 they accounted for 30% of the UK mortgage market. 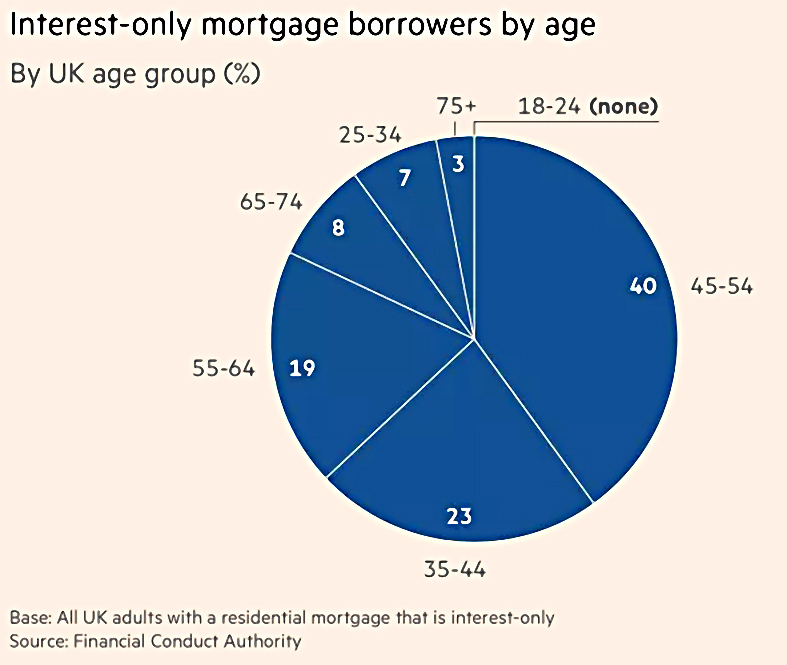 The chart shows that 70% of the UK’s 1.67M interest only mortgages are held by people over the age of 45. But given the ever-advancing age of first-time buyers, the 23% held by the 35-44 age group also seems pretty chunky. James is worried that most of the interest only borrowers will be over 65 when their loan matures (and they have to find the capital lump sum to repay it). This week the FCA warned of the proverbial “ticking time-bomb” because lots of the borrowers haven’t explained to their lender how they will repay. A significant minority aren’t responding to letters from their lenders, and their homes my be at risk. An extension of the loan will be an alternative for some, as will equity release. 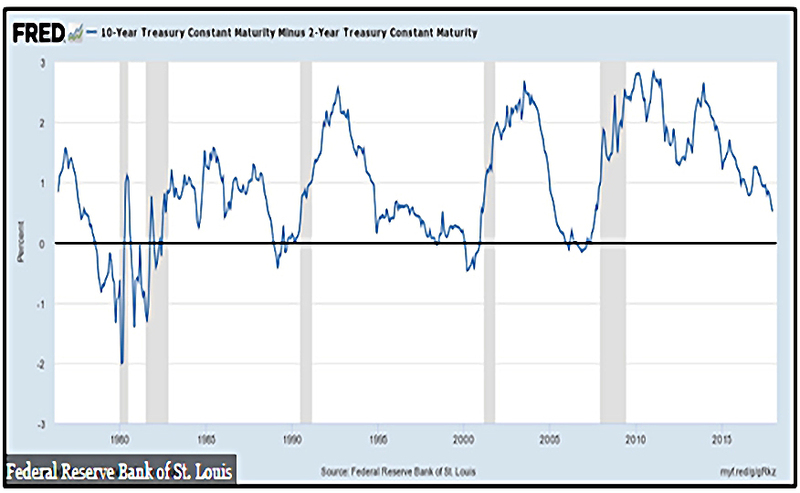 The maturity peaks are now, 2027-28 and 2032, with the later peaks particularly worrying (as they borrowers will have less equity in their properties, and lower incomes). John Lee’s column was another in his series on Small Cap Heroes, where a private investor talks about a small cap stock he has owned for a long time. 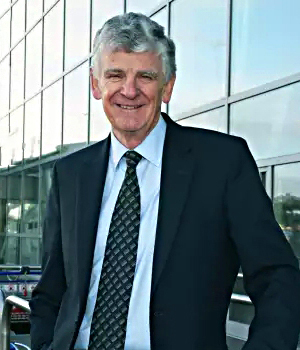 This week the investor was John Hough (a long-time friend of John Lee’s) and the stock was Mears Group. 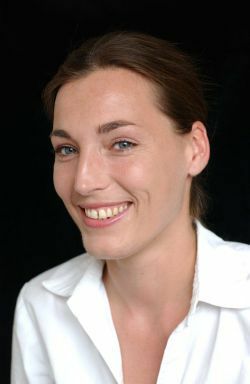 The company maintains social housing for local authorities. A more recently added division provides care services. 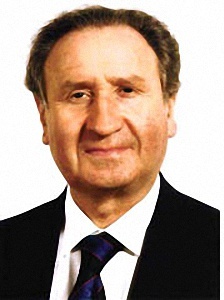 It was a £12M market cap when John H. first bought it in 1997. Today it has a £400M market cap, which it getting to the upper reaches of UK small caps. These days, Mears only makes up 2% of John H’s portfolio. But his original holding is up by 30 times (3000%). Merry’s column was about using gold as an inflation hedge. As luck would have it, we wrote about the metal yesterday. She began by talking about overcapacity (specifically in Japan, but also more generally) and its disinflationary effect. Too much stuff means lower prices for each bit of stuff. Hence QE and low wages. But she points out that China may be abandoning its growth at all costs strategy, and therefore may not further contribute to overcapacity. Which might in turn lead to some inflation. “Crypto-bugs” (as Merryn calls them) might suggest that bitcoin is a great inflation hedge. But Merryn worries about regulation from central banks. She’s sticking with gold instead. 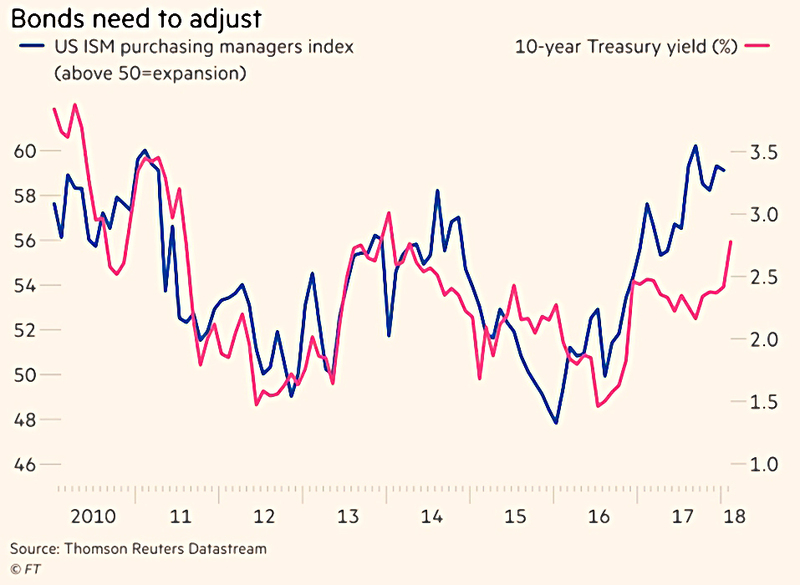 John Authers warned that markets are at a treacherous junction – because bond yields are finally going up. The 10-year Treasury hit 2.85% last week, which is high for the last decade, but not historically. Stocks had their worst week in two years (and this week has started badly, too). And of course bitcoin is down 60% from its peak. But that must be set against a long-term stock-market rally and increasing inflows to stock funds. Interest rates in the US have risen by 1% since December 2016, and another rise looks likely next month. So bond yields should be rising. John sees 3% as the next resistance point. 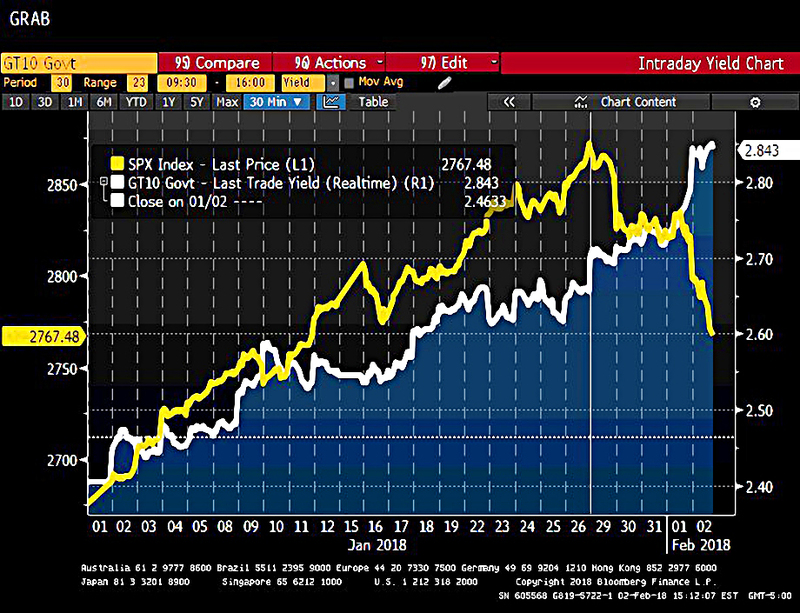 If this is breached, zombie companies in the US would be under pressure, and dollars could be withdrawn from emerging markets to tap into the higher rates. But a stock market crash might need yields to hit 4%. This would need more inflation to appear. And we also need to see whether central banks can hold their nerve, and not freeze or even cut interest rates. The Economist reported on a new safe asset for the eurozone. European banks tend to rely on domestic sovereign bonds for their capital. This means that if their is a risk of default in a country, that country’s banks automatically develop weak balance sheets. They have to cut lending, which further weakens the domestic economy. Eurobonds from all countries are the obvious answer, but this “runs the risk that the prudent pay for the profligate” – the tragedy of the commons once again. Enter sovereign-bond backed securities (SBBs). Issuers of SBBs will re-package a basket of bonds and pay holders as if they held the underlying bonds. and the last 20% would be very safe. It need changes to regulation to go ahead, and there are fears for liquidity in the issues that are chosen to make up SSBs. Worst of all, it sounds a bit like the CDOs from the credit crunch. The banks couldn’t make the same mistake twice – could they? The Economist also looked at factor investing, which they positioned as the institutional equivalent of the retail investors hunt for the legendary “ten-bagger”. Factor investing is also known as smart beta, though it has little to do with beta. More than $1 trn is allocated to factor strategies, with $658 bn in smart beta ETFs. Some people argue for dividend yield as a fifth factor, while others (including myself) see this as highly visible (and hence easily accessible) version of value investing. 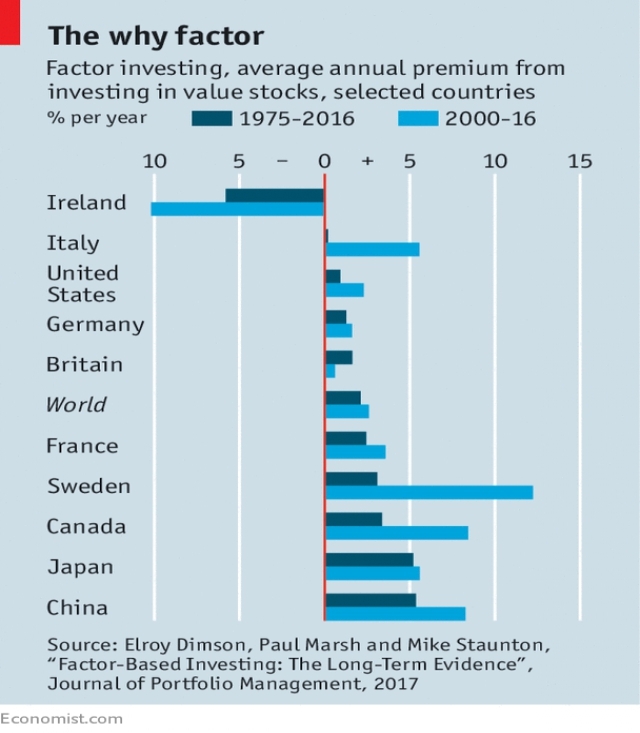 The article refers to research at the LBS which confirms that the factors work, though not all the time – and the underperformance can persist for many years (witness value investing since the 2008 crash). But it also refers to other research that shows that two-thirds of the 447 “factors” or anomalies unearthed by backtesting / data-mining cannot be reproduced. Stick to the main four however (preferably all at the same time) and you should do fine. The explanation for momentum is behavioural – later investors jump on board the train once it has started moving. Low volatility works because investors prefer “lottery-ticket” stocks that might produce high returns over a short time-frame. I plan to combine factor investing with trend following in a new portfolio to be built over the coming weeks (assuming that a major global market crash doesn’t get in the way). 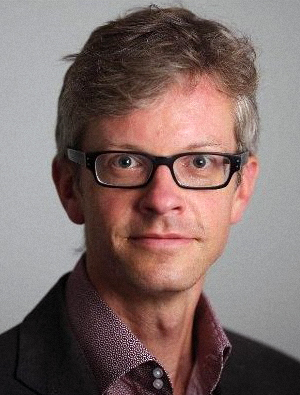 A third article in the newspaper argued that negative interest rates are fair and natural. It begins with an imaginary shipwreck economy1 based around a limited supply of hard tack (ship’s biscuit). The loan of a biscuit should be repaid by the return of more than one biscuit, since interest is a reward for deferring gratification. But in practice the interest would be zero, since no sailor would agree to borrow (and repay more than one biscuit) when he could eat his own biscuit and deplete his (future) store by exactly one. And a sailor who had eaten all his store would have no way of repaying a loan in any case. They were lucky – if the foodstore were perishable figs instead, those with an excess would have to accept a negative interest rate. An earlier thought experiment2 dealt with a lone “Robinson Crusoe” shipwreck. Crusoe tries to save three years of provisions so that he can focus on building a canal (not sure why). He must use effort in preserving meat and wheat and buckskin, but is doomed to negative returns from “shrinkage”. Loaning his own stores saves him the effort of preservation, and he can accept a negative interest rate (so long as it is better than his own shrinkage rate). With only one stranger, there is a mutual dependency. 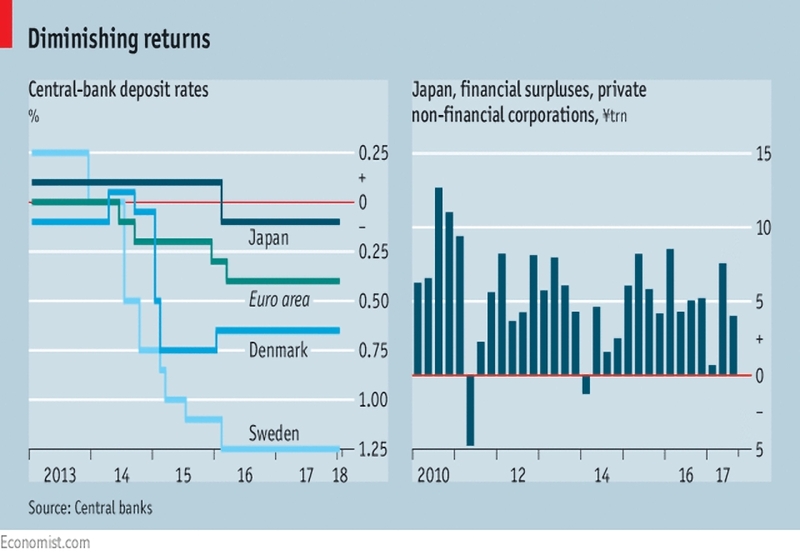 Scroll forward a hundred years and we have lots of negative interest rates for central bank deposits. When borrowers are scarce and people hoard their money, they need the incentive of decay (negative rates) to encourage them. But it still feels wrong to me. I have seven for you this week. 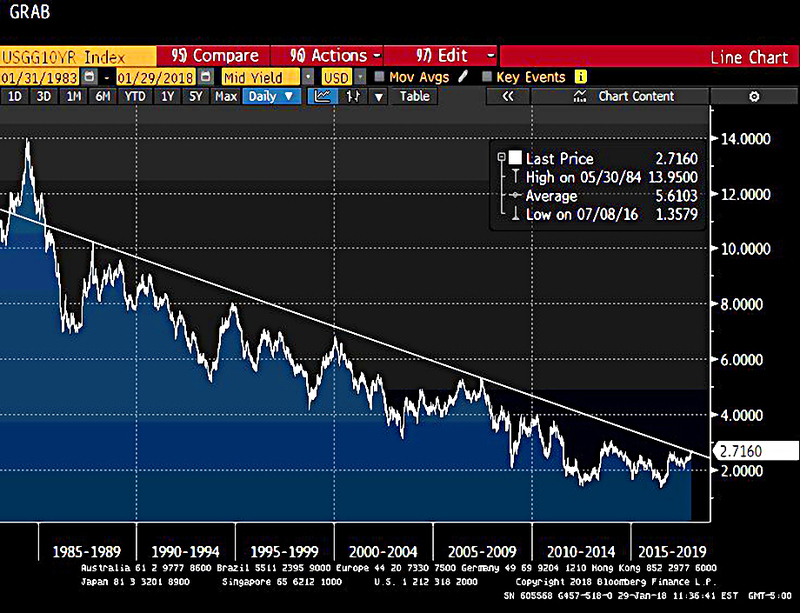 Given the current turmoil in the equity markets, let’s start with a few about bond yields, the most likely trigger for the current falls. Here’s the end of the bull market in bonds. Or maybe not – some nitpickers insisted that the price hadn’t broken two standard deviations away from the trend. Add stocks to the chart and the break point looks pretty clear, whether its two standard deviations or not. 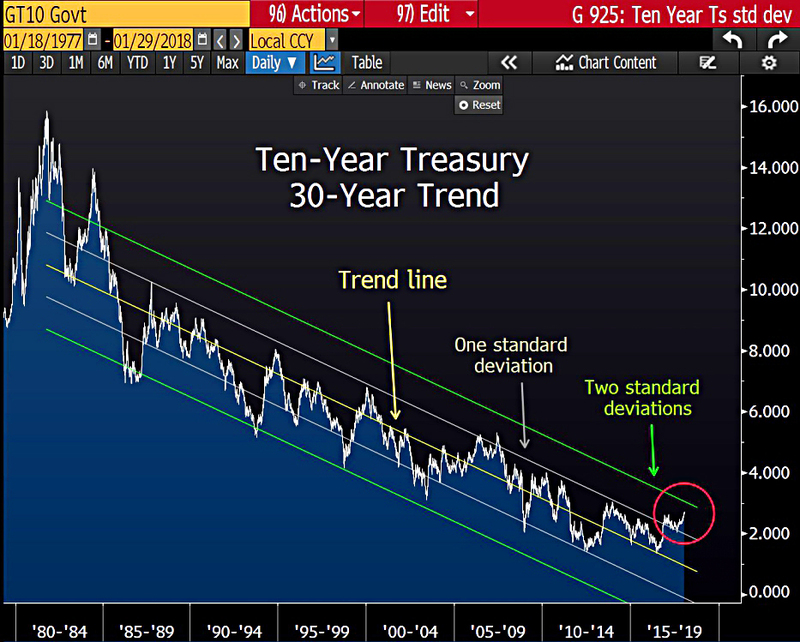 Here’s another way of looking at it – this chart compares the gap between the 10-year and 2-year treasury yields. When the gap goes to zero, we have an inverse yield curve, which usually means bad times ahead. The bad times for stocks seem to have turned up before we got there. Now on to time frames. 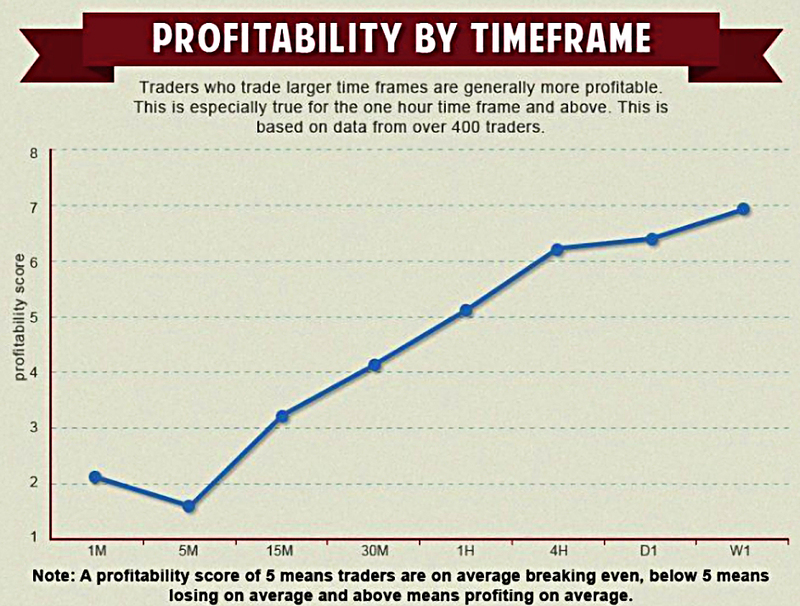 This chart shows that those who trade from charts based on timeframes of less than one hour have a lower than break-even chance of making a profitable trade. For one hour and above, the odds are in your favour. I normally use the one-day chart as I’m not a day trader, but last week I made my first trade from a one-hour chart (shorting bitcoin, since you ask) – and it was profitable. Looking at the diagram, I should look into using weekly rather than daily charts. Here’s another one on timescales. 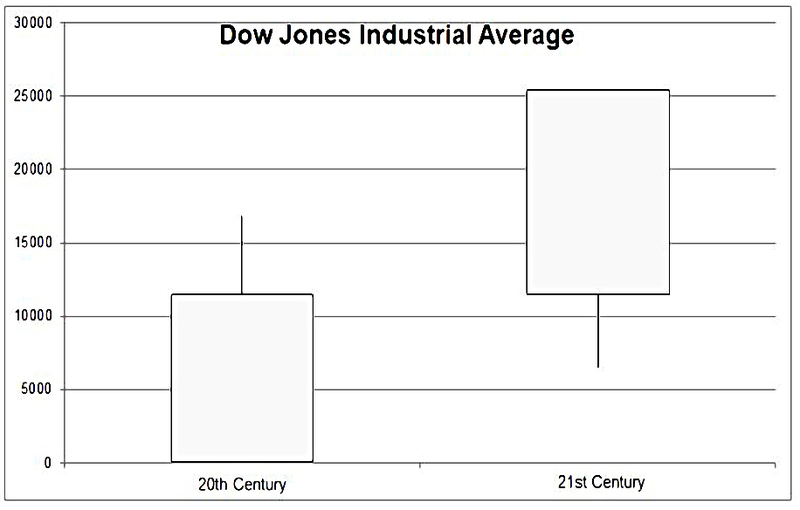 This time it’s a tongue-in-cheek look at the Dow on a century by century basis. It won’t look quite as good after the falls of the last week, but it will still be pretty decent. 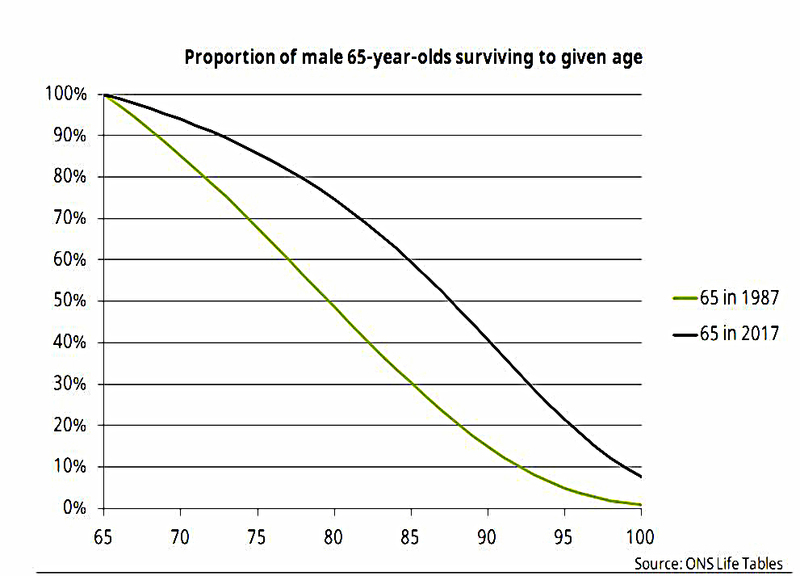 We end with another cheery chart, of UK male life expectancy. I’m still a few years away from 65, but my chances of making it to 85 have increased from 30% to 60% over the last thirty years. We begin today's Weekly Roundup in the FT, where John Authers was looking at the history of bubbles and crashes.